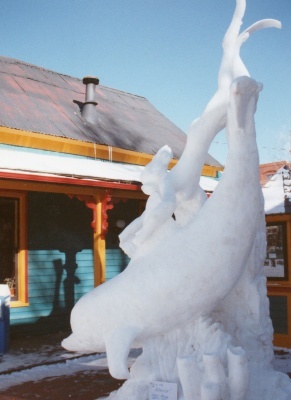 In the 1970s a couple of Realtors started organizing town folk to make sculpture out of one of Breckenridge's most readily available resources - snow. If you've followed the Breckenridge competition over the past 20-some years, you've probably heard of Carvin' Marvin and the Snowflakes - Breckenridge Associates' own Rob Neyland and Ron Shelton, who were part of this original band and spent many years carvin' out in the cold and organizing the event in steaming city council meetings trying to get the event national, and then international status and into the world-acclaimed event it is today. Thousands come to see the event every January during the week it takes the artists to make the sculptures and the following week - sun willing - that the works are left standing. 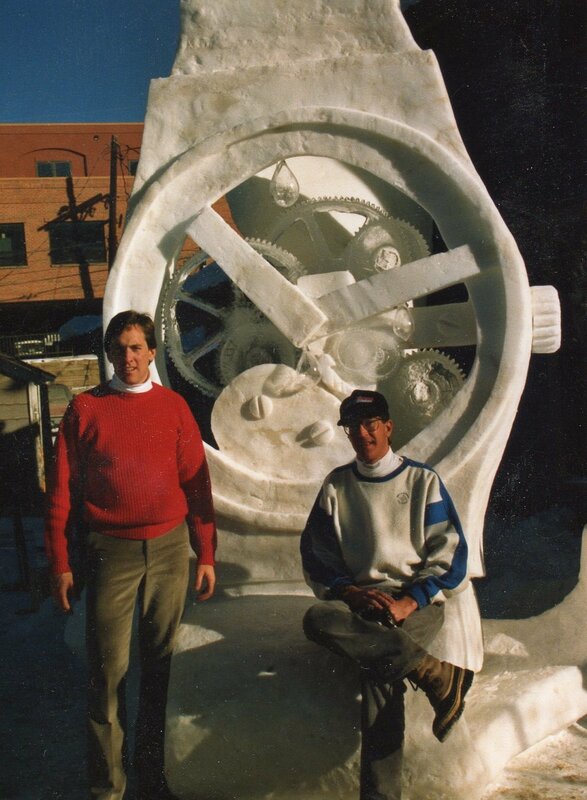 Snow sculpture in Breckenridge began in the 1970s at Main Street businesses like Moore & Co.
Back in the '70s, during Ullr Fest, amateur teams made sculpture from giant heaps of snow in front of shops on Main Street. Ullr Fest was, and still is, Breckenridge's annual winter carnival named after Ullr, a somewhat fabricated god of snow, so making snow art fit right into the celebration. 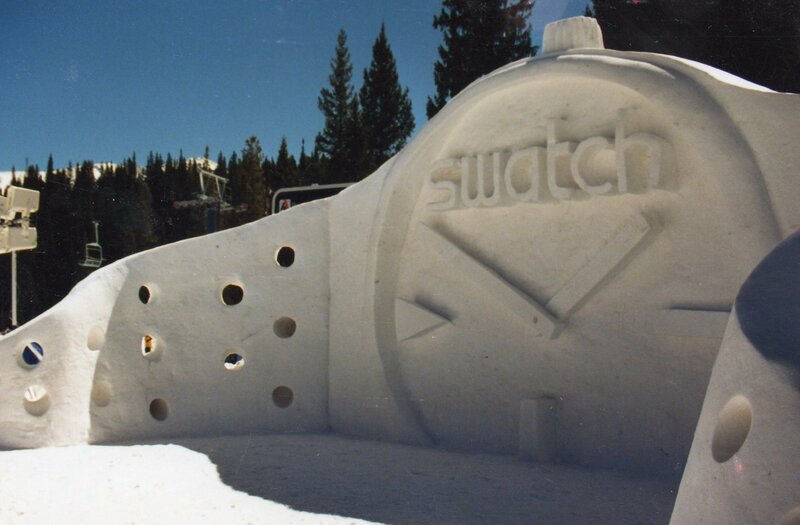 According to Neyland, the Breckenridge event is one of the best in the world because of the weather - much colder and dryer than other event locations; the quality of the carving blocks made by the Breckenridge Ski Resort with man-made snow, and because of the willingness of the community to put itself out. For example, the town gives up some parking, local lodging companies give rooms to house more than 80 people who come to carve and judge, local restaurants and caterers provide food for the sculptors, and the town redirects Public Works staff and equipment to this big event. And many local business donate their services as well. For years Columbine Hills Concrete would supply the forms and the man power to assemble the blocks, Breck Iron brings outdoor gas fire pits to warm participants, lighting companies have provided color and interest to nighttime viewing and the radio stations would pipe in music. Teams spun off from the original Snowflakes have continued to compete at state championships, have traveled to the U.S. finals in Lake Geneva, Wisconsin, to Canada, France, Russia and Italy. 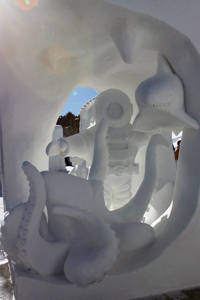 The Breckenridge International Snow Sculpture Championships bring more than 30,000 people to Summit County to see the sculptures and the event has been covered by several national TV shows, a documentary and lots of print media every year. A week before the competition begins each January, the town and sponsors like Breckenridge Crane and Stan Miller, Inc. erect forms in the Riverwalk Parking lot. These 10-foot x 10-foot x 12-foot forms are filled with snow made on the mountain and trucked to town. Volunteers climb into the forms and pack the snow. More snow is added and compacted by more volunteer feet until the height is more than 12 feet – with a finished weight of about 40,000 pounds. Then, the form is removed, and set up to make another block. The town’s event staff knows how many teams will arrive to carve snow. They selected teams from submitted designs and resumes early in the fall, and have been coordinating travel ever since. In the 1990s up to 18 teams arrived on the third week of January to make sculpture, and most were from a different country. After 9/11, visas became harder to come by, and the competition evolved to include more teams from Canada, Mexico and the U.S. 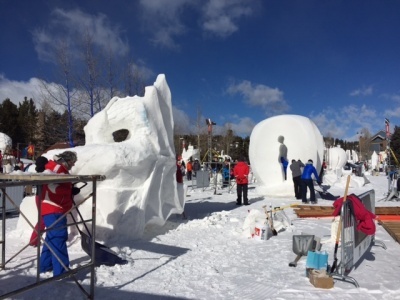 Participating artists are not paid to make these snow sculptures but are given room and board and some help getting to Denver, and transportation to and from Breckenridge and generous lodging. Sculpting begins on Tuesday. Power tools have never been permitted in competition, although sculptors who make the sponsors’ snow or ice works do use them. So while there may be 16 or so teams competing, there are several other unique sculptures to see every year. Each team comes with a variety of hand powered tools from ice saws to cheese graters. No internal supports can be used, nor artificial colors, but many teams freeze ice for details, or use a variety of methods to develop texture and delineation on the snow. If the weather is warm and sunny, spinnakers might fly for shade, different markings and measurements will show up on the block. And generally, a lot of snow will be removed on the first two days. But by Thursday, the sculptures, although rough, have a form of their own. Locals often make a daily trip to the site to see how the sculptures are progressing. Friday is the last full day of competition and the teams are allowed to work around the clock until the final bell at 10 a.m. on Saturday. Judging starts then, and usually ends around noon. An awards ceremony follows. The judges are different every year, but usually are artists or arts professions from Colorado. One year an Icelandic sculptor was part of the jury.